Inspirations for dissipating anger: Dalai Lama and Bodhisattva Never Despise | Jon Katz, P.C. The Dalai Lama said: "Tolerance can be learned only from an enemy; it cannot be learned from your guru." (Image from the public domain). I grew up with a lot of suspicion about plenty of other people and with a lot of upset and anger over the present and past history of the most vile and inhumane mistreatment of humans by other humans. It started with an obsession over the Holocaust and other genocides, race-based concentration camps, and racist violence and subjugation, and continued from there. When I tried to do something to stop human rights violations, for instance by becoming very active with Amnesty International in college and law school, a problematic byproduct was the constant realization of how far humans have yet to go in stamping out inhumanity, no matter how far the world has progressed overall in that regard. Obsessing over human rights violations, over a far from perfect world, and over my future and general lot in life, I missed out on many of the joys of the moment, and often felt very alone. Amnesty International’s message has been to light a candle for justice rather than cursing the darkness, but that did not sufficiently sink in for a long time that this was a way also to emerge from all the gray I felt in life. Abbie Hoffman was a living example of having fun while fighting injustice, but I did not know his message for many years. How many other people, when asked "What were you doing during [some major historical event]?" can only shrug their shoulders to say they missed it all, during the daily grind of work and life, the commercial monster, commuting, eating, sleeping, and beer? Clearly, I needed to break out of this cycle. As often is the case with solutions to our problems, the answers have always been available for me to dissipate my anger over global and local injustice and criminal justice system injustice, and to have more faith in others’ ability to do good and in my ability to inspire them to do good — rather than walking down the street suspicious of others’ intentions and thoughts. After becoming a trial lawyer, dissipating my anger and cynicism about people became all the more critical. Dissipating anger and tension makes one a more powerful fighter; not dissipating anger and tension harms my clients. Two of my most influential inspirations for dissipating anger and suspicion of others are the Dalai Lama and Bodhisattva Never Despise. As with Gandhi and Martin Luther King, Jr., it is remarkable that the Dalai Lama sets forth with boundless non-violent optimism for the present and future, despite the decades of severe violence and repression by the Chinese government against his fellow Tibetans. The Dalai Lama has said: "Tolerance can be learned only from an enemy; it cannot be learned from your guru." 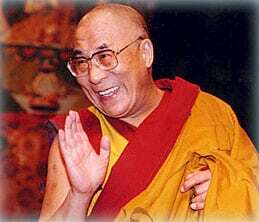 On October 17, 2007, the Dalai Lama comes to Washington, D.C., to receive a Congressional medal. Congress should practice what it preaches about this medal. Congress members cannot go honoring the Dalai Lama’s fight for justice without honoring and fighting for justice in the work they do day in and day out. In any event, here is a link to the Dalai Lama’s public appearance on October 17 and related events. Thanks to a very close friend for forwarding me the link. Helping me in finding inspiration towards dissipating anger while fighting hard for justice, a few years ago, I started letting my guard down all the more about whether people would try to convert me to their religion if I tried to find some inspiration from them. As a result, I have found much inspiration from some dynamite church gospel choirs, Ram Dass and his gurus, the Plowshares Catholic peace activists, the Dalai Lama, and the list goes on. I have heard it suggested that it can be more easy to convert a rigid adherent of one religion to another religion, which would make me a tough nut to crack, being the longtime agnostic that I am. In that regard, the Dalai Lama once said: "For those who may not find happiness to exercise religious faith, it’s okay to remain a radical atheist, it’s absolutely an individual right, but the important thing is with a compassionate heart — then no problem." No wonder so many people are drawn to the Dalai Lama, even if they are not Buddhists themselves. Much less well-known than the Dalai Lama, but equally inspiring to me is Bodhisattva Never Despise, who is discussed many times in Yumiko Miyazaki’s translations from Nichidatsu Fujii Guruji in a new and superb one-volume compilation entitled TRANQUIL IS THIS REALM OF MINE: Dharma Talks & Writings Of The Most Venerable Nichidatsu Fujii. My friend and teacher Takako Ichikawa gave me the book a few weeks ago, which is particularly fortunate in that it does not seem to be on the physical or Internet bookstands yet. Ryuei Michael McCormick said that: "Bodhisattva Never Despise had one simple practice, which was to bow before everyone he met saying, ‘I respect you deeply. I do not despise you. Why is that? It is because you will be able to practice the Way of the Bodhisattvas and become Buddhas.’ Even in the face of intolerance and persecution by those who did not want to hear the teaching of universal awakening, he never ceased to practice this deep recognition and respect for the Buddha-nature, the potential for awakening, within all beings. This kind of practice over innumerable lifetimes is what culminated in the Buddha’s recognition of all beings Buddha-nature and subsequent intention to help all beings realize this for themselves as he sat beneath the Bodhi Tree on the morning of his own awakening." Once I am able sincerely and unhesitatingly to display such deep reverence even to my worst adversaries, my anger will be dissipated more than ever, and I will be all the more powerful. As my close friend Trudy Morse would say, it was no accident that I received Tranquil is this Realm of Mine when I did. Jon Katz. ADDENDUM: This blogposting originally was uploaded at 12:01 a.m. on October 5 with a greater focus on the Dalai Lama’s October 17, followed by a significant rewrite. ADDENDUM II: The only October 17 puplic appearance I found for the Dalai Lama will at 2:30 p.m. on the Western Lawn of the Capitol. Unfortunately, it appears that excessive security may prevail.